You are here: Home / Featured / Midnight Sons & Darkhold Reading Order! This Patreon request for a “Midnight Sons” reading order sent me down a deep (sometimes literally) dark hole into the supernatural mythology on the fringes of the Marvel Universe. 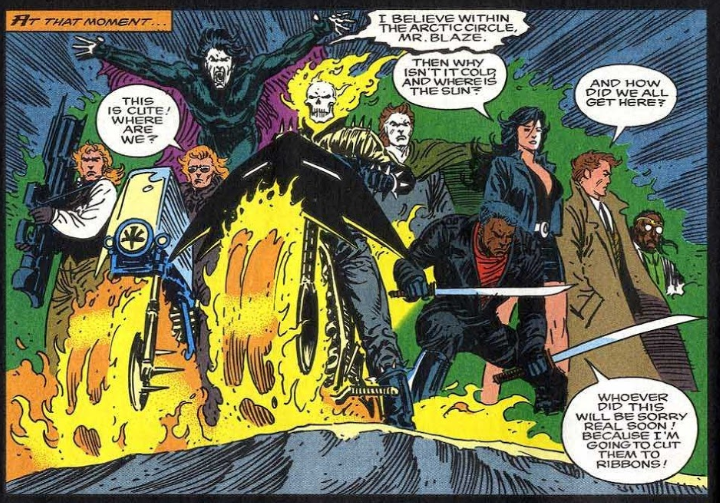 The Midnight Sons launched in the early 90s with an initial lineup consisting of known Marvel characters like Blade, Ghost Rider, and Morbius the Living Vampire. The focus of the comics was around demons, dark magic, and horror, in that magnificent 1990’s Marvel style. 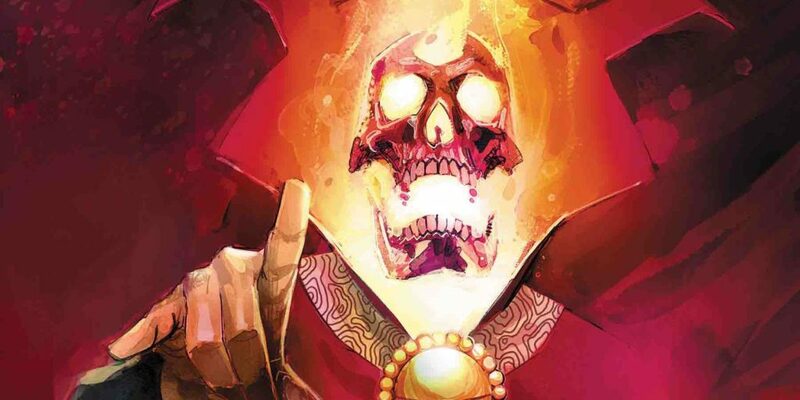 Despite the popularity of some of the heroes involved – including plenty of cameos and eventual involvement from Doctor Strange – the entire “Midnight Sons” era is strangely underrepresented at time of this guide’s publication (early 2019). Very few of these comics are added to Marvel Unlimited (oddly, the first 15 issues of the 16 issue Darkhold series made the cut) and a similarly low quantity are even collected in trades. Nonetheless, if you can track them down, below you’ll find the complete guide to “Midnight Sons” and “Darkhold” comics through Marvel history! A decade spanning collection that tracks the use of the black magic in the Darkhold throughout Marvel’s Bronze Age. The Darkhold was created by Gerry Conway and Mike Ploog in the pages of Marvel Spotlight (in a “Werewolf by Night” story). This is not essential to jump in to “Rise of the Midnight Sons,” but it if you’re invested in the dark magic of the Marvel Universe, this will provide a lot of context and explore its use leading up to the 90’s! 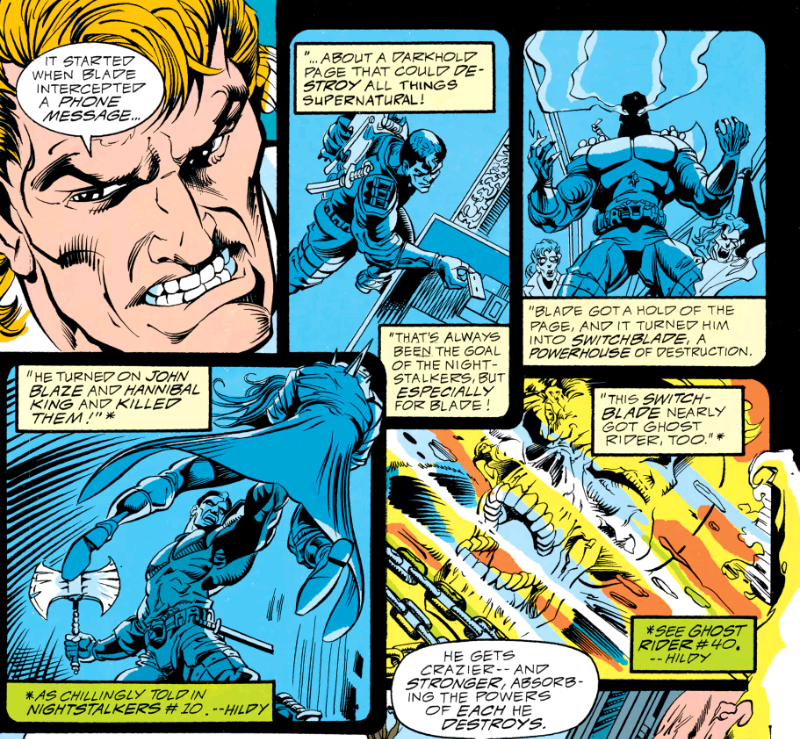 The “Midnight Sons” launch in the pages of Ghost Rider, and if you’re familiar with the broad strokes, the specifics of the 90’s might be a little confusing. Suffice it to say 1990 brought a new Ghost Rider to the scene, with Danny Ketch rocking the flaming skull and motorbike. Fans of this era will likely want to be as up to speed on Ghost Rider as possible, as the title remains essential throughout. As of early 2019, “Darkhold” is the only series from this collection included in Marvel Unlimited. Which is *extremely* strange considering the popularity of this early 90’s squad and the existence of this collected edition! The book of sins gets its own ongoing as part of the launch of Rise of the Midnight Sons. The “Midnight Sons” roll into their next crossover approximately 10 issues later for each new series, this time with the Darkhold turning Blade into a magical murderer extraordinare known as… Switchblade! As you likely surmised, you should read the preceding issues of each series of your choice prior to this crossover. Immediately following the “Midnight Massacre” the Ghost Rider and Spirits of Vengeance suite launch into their own pogo see-saw crossover. The lengthiest and final crossover of the 90’s “Midnight Sons” era comes in the form of “Siege of Darkness!” It’s an appropriately bit of synchronicity with the “Rise of the Midnight Sons,” as paranormal Lilith is now joined by Ghost Rider big bad Zarathos in an attempted conquest of Earth. Doctor Strange joins the fray, the Darkhold series comes to an end, and the whole she-bang weirdly concludes in the pages of Silver Sable! Since 90’s nostalgia is all the rage in the 2010’s, the “Midnight Sons” have returned in a few modern forms. It’s a subplot, sure, but there is a newly formed team in this post-Secret Empire crossover book. For the more detailed reading order, check out Comic Book Herald’s guide to Damnation. Very short-lived Marvel Legacy comic.